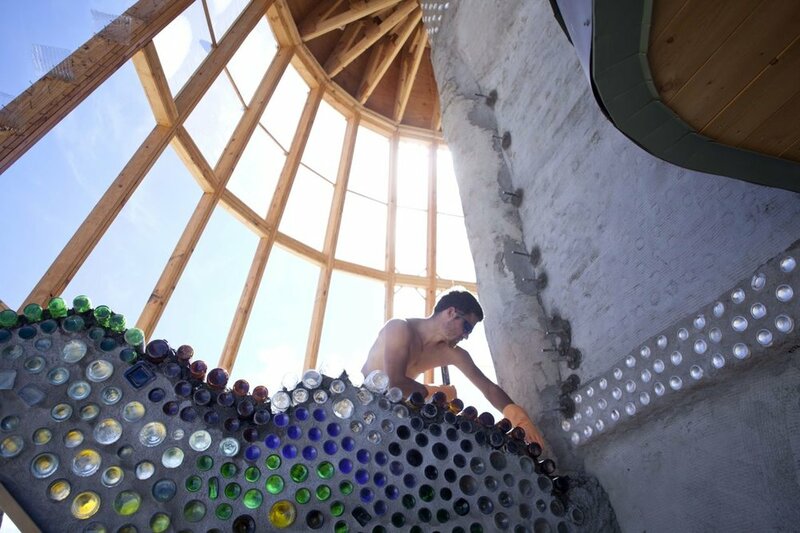 The Earthship Biotecture Academy offers extensive training in Earthship design principles, construction methods, and philosophy. Academy classes, labs, tours, and hands-on construction techniques are led by top Earthship builders, electricians, plumbers, and plant specialists. 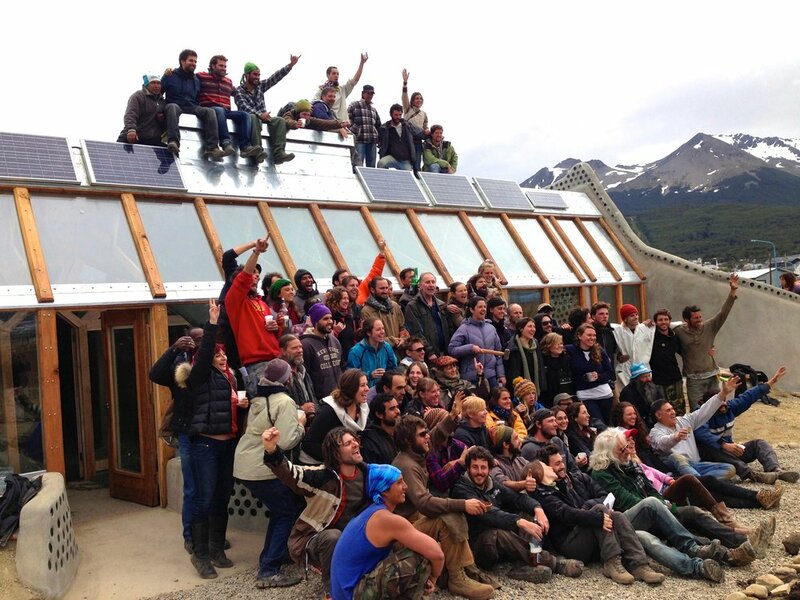 The Academy offers education for those who are excited to learn and live the Earthship philosophy and help expand it globally. Earthship Biotecture Academy partners with Western Colorado University’s two-year Master in Environmental Management graduate degree. Participants in the academy can also earn undergraduate credit to be applied to their bachelor’s degrees in universities across the world. In addition, AmeriCorps volunteers can apply their Segal Education Award to attending the Earthship Biotecture Academy. Dr. Jessica Young and Dr. Scott Borden introduce an exciting partnership between the School of Environment and Sustainability, Western's Master in Environmental Management, and the Earthship Biotecture Academy. The Academy has trained over 1400 students from around the world. Students come from diverse backgrounds, many are trained architects, municipal planners, artists, teachers, industrial designers, professional builders, community and environmental activists. There are no prerequisites to attend our program, however applicants must be self-reliant and prepared to work in an intense group environment and take care of themselves physically, financially, and emotionally. There is no time limit on completing the path to graduation. Some students pursue their degrees in Earthship Biotecture aggressively, others are content with the knowledge they gain during their Academy session and do not strive to graduate. 1- ACADEMY SESSIONS: Complete an Academy session in Taos or a Global session (95% attendance in the classroom and participation in hands-on work as well as a passing grade on the Final Exam are required). 2- FIELD STUDY: Students receive credit towards this requirement by participating in an official Earthship Biotecture Field Studies project. Field Study opportunities are intended to help further student's knowledge of hands-on building techniques by inviting them to work alongside the Earthship Biotecture crew on a ground up build. They are usually offered 2 to 3 times a year in the US and internationally. Projects range in duration from 2-8 weeks. There are two types of Field Studies offered: client builds, and humanitarian builds. For either type of Field Study, students are responsible for their own transportation, food and lodging. 3- INDEPENDENT STUDY: The Independent Study may take place anywhere in the world and may be physical (launching a demonstration project in China, staging and facilitating a relief project in Haiti) or digital (designing a CAD model of an Earthship city in Turkey, mapping Pockets of Freedom in Australia). Students may propose their Independent Study after they complete the Academy Session and Field Studies requirements. Independent Studies must receive written approval from Academy Staff and are subject to review to qualify for credit. We offer: a $ 500 USD discount on tuition for veterans and Earthship interns / 10% off for couples and friend coming together / $500 discount for all Western State Colorado University students (only one discount can be applied). And starting in 2019, we will also offer a $1,000 USD discount for students registered with the Western State Colorado University doing their Master in Environmental Management . The curriculum for each session is identical and consists of classes, labs, hands-on construction, and tours of many Earthship and pre-Earthship buildings. You only need to attend one of the sessions. Sessions are intensive and are six days a week for four weeks. Half of the time is spent in the classroom and half on learning hands-on techniques on the construction sites. 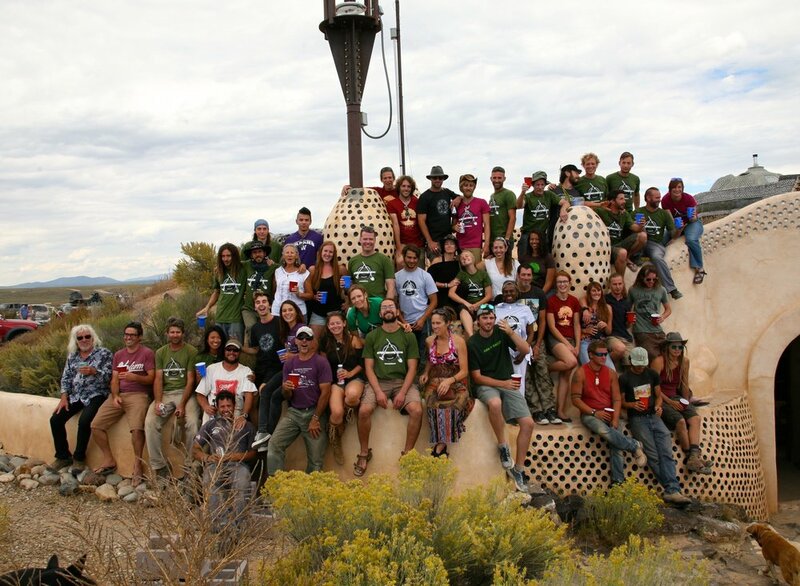 Please click here: 2019 Earthship Academy Application Form and fill in the downloaded form, if you are interested in attending the Earthship Academy in Taos, New Mexico, USA. Students typically work on at least two different Earthship construction projects, usually a Global Model Earthship and a Simple Survival Earthship and/or an experimental project like E.V.E. (Earthship Village Ecologies). Instructors divide the class into smaller groups and work on a variety of aspects like such as pounding tires, can and bottle wall construction, adobe mud pack-out and plaster, carpentry, roofing, glazing and independent power and water systems. Classes are typically an hour and a half long. The Labs give students a chance to go in-depth with technical aspects of the Earthship systems. With guidance from our Plumbing Specialist, students build a Water Organizing Module and learn about all filters, pumps and valves. Students also do hands-on basic electrical wiring for lights and switches. During the Earthship Maintenance Lab students learn all aspects of caring for an Earthship building from servicing the batteries for the solar system to cleaning out the grease and particle unit of the gray water system. Students participate in guided tours of at least 15 different Earthships and pre-Earthship experimental buildings. These tours showcase a variety of Earthship types: Packaged, Modular, Custom, Global, and Simple Survival. On many of the visits, the residents of the Earthship are present to answer questions about their homes including modifications they have made and how they have made their lifestyle fit their building. The Earthship Academy is based at the Greater World Earthship Community which is the world's largest sustainable, approved subdivision and home to the world's first Sustainable Development Testing Site. 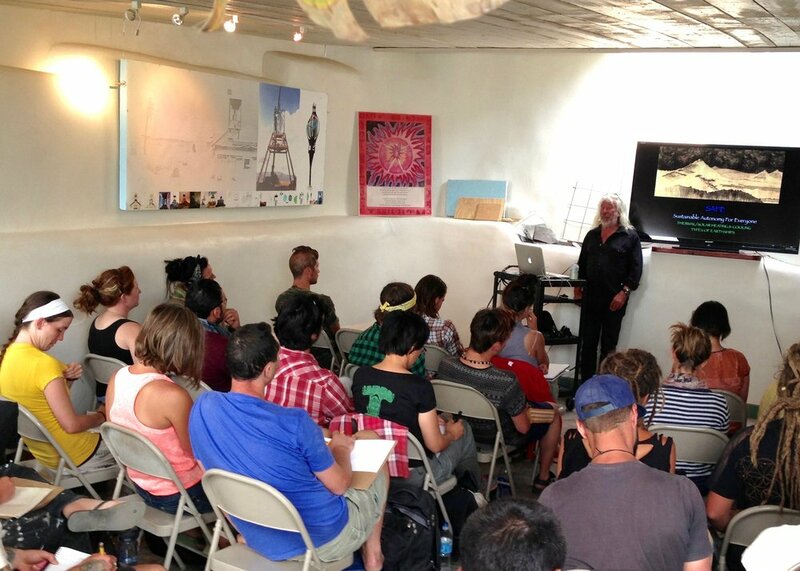 Classes are held at the Academy Classroom which is housed in a modular Earthship at the entrance to the community. Hands-on building takes place within the community, on the the Test Site and at other locations in the Taos area. We offer very basic, dormitory-style housing to Academy students for an additional fee. The accommodations include early Earthship attempts, Earthship-inspired buildings, and our latest Simple Survival models. These spaces are rustic and experimental, and you must be prepared for camping-like conditions. Some of the water and power systems of these buildings are designed for minimal use only, not for ideal comfort. We consider living in the Earthship accommodations during the Academy session, to be part of your education in understanding Earthship concepts. They are not meant to impress you in terms of comforts rather they are meant to educate you on what must be learned in order to build and live in Earthships. We have set the prices of these accommodations to be lower than equivalent housing around the Taos, New Mexico area. Prices range from $450 - $800 for the duration of your session. These units are available on a first come first served basis. Should you choose to camp or find your own housing, we can provide a list of recommendations. Please note camping is not available on the campus itself. Also, if you are planning on finding your own housing outside of what we offer we strongly advise having a car, as Taos is quite spread out and there is no public transportation.